Every few weeks, my girls and I visit our local dog park to hang out with our neighbors and play with their dogs. We also come home relaxed after these fun excursions! While we don't have a dog at home, I definitely see the benefits that some kids can receive when they grow up with a dog (assuming that nobody in the family is allergic to them). 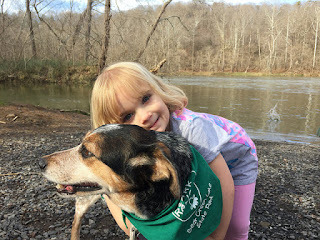 For some people, the simple act of petting a dog can raise serotonin and dopamine levels, the chemicals that are responsible for helping kids feel positive, peaceful, and calm. Pet ownership can also lower blood pressure and ward off depression. Any time your kids feel emotionally escalated, worried, or upset, they can pet or play with the dog and feel their bodies and minds relax. In addition to daily and weekly chores, your kids can help take care of the family dog. As your kids walk, feed, and groom their dog, they learn to fulfill obligations each day, be responsible, and stay accountable. These skills ensure that their pet is cared for and help your kids succeed in other areas of life, too. Kids with a dog can feel a sense of accomplishment and pride as they perform age-appropriate pet care tasks and ensure that their dog stays happy and healthy. For instance, maybe your four-year-old son can't walk the dog by himself, but he can give it fresh water each day and join you during vet check-ups. Your child's face will shine with pride when he tells everyone he meets that he helps to care for his dog. When kids must care for an animal, they learn to read nonverbal cues, nurture a living being, and put their pet's needs before their own. All of these skills help them develop empathy and compassion for other living beings, including family members and friends. Our library hosts "read with a dog" events, and my girls regularly participated when they were younger. They always appreciated reading to the attentive dogs, sharing pictures, and talking about the story without worrying that they would be judged or ridiculed for mispronouncing a word. Studies show that kids relax and have fun when they read to pets, so consider giving your kids a leg up on their learning by letting them study with the family dog. When kids face emotional, scary, or frustrating situations, they don't always have the words to talk about the situation with an adult. A pet offers a sympathetic, listening ear, though, and won't judge, criticize, or counsel our kids. While we don't have a dog at home, my girls often turn to their stuffed animal friends for comfort when they're frustrated, and they always emerge from their snuggle time feeling more positive and peaceful. Most dog breeds need plenty of exercise and give your kids the perfect excuse to keep moving. As your kids walk the dog, take it outside to use the bathroom, or play fetch, they get exercise and ensure that the dog receives the stimulation and exercise it needs for better health. Both your kids and your dog will be happier and healthier as they spend time together. When you add a dog or another type of pet to your family, your kids can gain these seven benefits, and you'll have fun as a family caring for and bonding with your pet and each other. Are there other benefits of growing up with a dog that you've noticed?